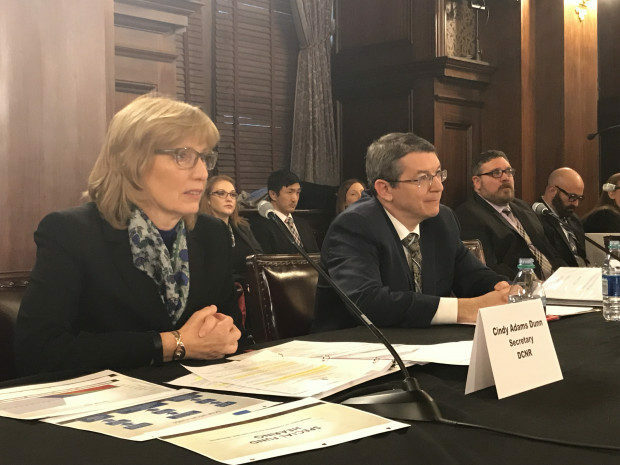 MARIE CUSICK / STATEIMPACT PENNSYLVANIA Department of Conservation and Natural Resources Secretary Cindy Dunn and Department of Environmental Protection Secretary Patrick McDonnell answered questions at a House hearing Thursday. As state lawmakers keep looking for ways to plug an estimated billion-dollar hole in Pennsylvania’s budget, they are scrutinizing state agencies’ use of special funds, which include money to promote environmental programs. At a House Appropriations Committee hearing Thursday, legislators quizzed Patrick McDonnell and Cindy Dunn, who lead the state Department of Environmental Protection and Department of Conservation and Natural Resources, respectively. The special funds include things like cleaning up industrial sites and promoting recycling.